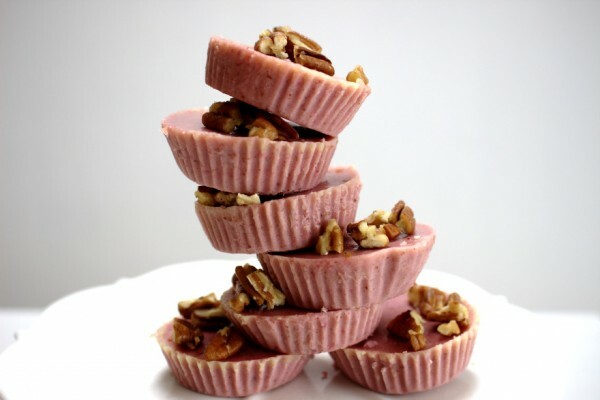 These raspberry and white chocolate cups are pretty epic. The idea for them came one night while I was trying to sleep. Yes, I am actually that food obsessed that sometimes recipe ideas keep me awake at night. I had to stop bringing recipe books to bed as my night-time reading. My mind would be racing all night! 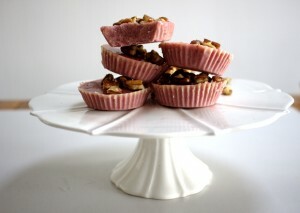 I was so happy with how my white chocolate cups and my white chocolate and almond butter layer cups turned out that I just had to try these. You can find those recipes by clicking here. Let’s just say that the day I found out that cacao butter was legal on the Specific Carbohydrate Diet (SCD) was a good day. It has opened up a whole new world of dessert and snack ideas to me. Even though cocoa powder is not legal, the fat a.k.a the cacao butter is. Yay, for small victories! I did try a little cacao powder once as an experiment and it did not sit well with me so I won’t be introducing that for a long time. Cacao butter on the other hand causes me no problems so you’ll likely see it cropping up here quite a bit. My daughter thought these were so delicious. Of course, she helped me make them so she is definitely a little biased. If I’m giving them her obviously I omit the pecans. Cacao butter is quite expensive but a little goes a long way. I used almost a full bag for this but it made 24 raspberry and white chocolate cups which should last you weeks if you eat them as an occasional treat. Ahem! I promise I didn’t eat three in a row. Although, I would consider them a healthy treat, they do contain honey so should be eaten in moderation. Due to the cacao butter and coconut oil, you’ll need to keep these in the freezer or they’ll melt quickly . You don’t need to leave them thaw when you want one. As with all my recipes, this can be easily doubled. 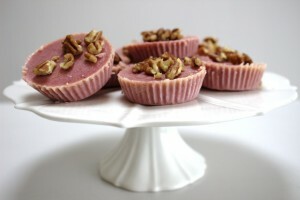 Delicious raspberry and white chocolate cups free from: gluten, grains, dairy and refined sugar. Paleo and Specific Carbohydrate Diet-friendly. 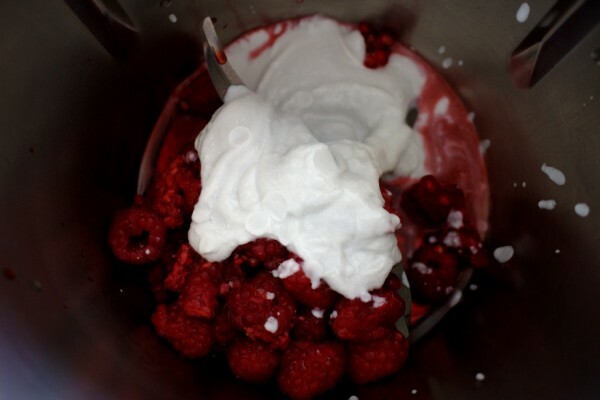 In a blender, blend the raspberries and coconut milk until smooth. Add the cacao butter mixture and blend until combined. 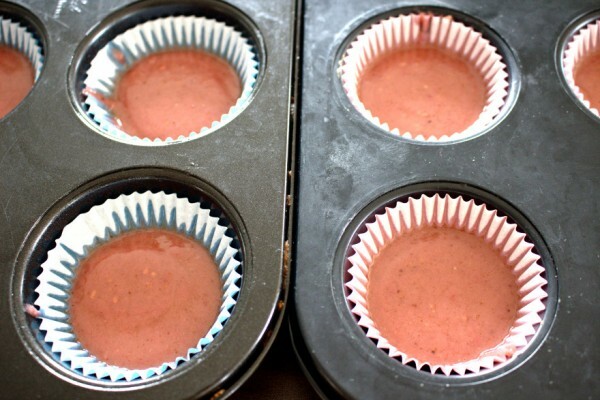 Add the mixture to the muffin cases. Freeze for at least two hours until well set. I keep these in the freezer all the time. 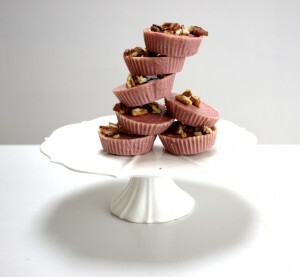 Decorate with pecan nuts, if desired.